Eight people – O, P, Q, R, S, T, U and V – live on eight different floors of a building but not necessarily in the same order. The lowermost floor of the building is numbered one, the one above that is numbered two and so on till the topmost floor is numbered eight. Each one of them likes a different game – Crossy Road, Temple Run, Candy Crush, Fruit Ninja, Subway Surfers, Hill Climb Racing, Angry Birds and Clash of clans but not necessarily in the same order. U lives on floor number 6. Only one person lives between U and the one who likes Fruit Ninja. Only two people between the one who likes Fruit Ninja and the one who likes Clash of clans. The one who likes Clash of clans lives on one of the floors below the one who likes Fruit Ninja. S lives on one of the odd numbered floors above the one who likes Clash of clans. 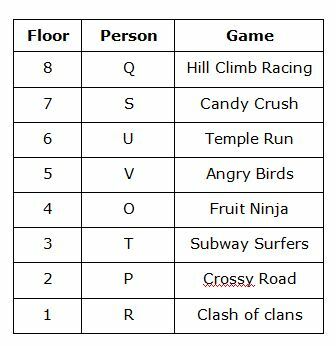 The one who likes Temple Run lives immediately below S but not on floor number 2. Only four people live between S and the one who likes Crossy Road. As many people live between the one who likes Crossy Road and Clash of clans as between S and the one who likes Hill Climb Racing. Only two people live between V and the one who likes Hill Climb Racing. Only two people live between V and the one who likes Hill Climb Racing. Only three people live between T and the one who likes Candy Crush. V neither likes Candy Crush nor Subway Surfers. P lives immediately above R. O lives immediately above the one who likes Subway Surfers. How many people live above the one who likes Angry Birds? How many people live between the one who likes Fruit Ninja and the one who likes Subway Surfers? On which of the following number does Q live? Four of the following five are alike in a certain way based on the given arrangement and hence they form a group. Which one of the following does not belong to the group? Who lives immediately above P? Eight persons are sitting in a straight line facing North. They are studying in different standards/pursuing different courses and are sitting in such a way that all the seniors of every person is sitting to the right. Therefore, no person who is in a higher standard is sitting to the left of any person. Who sits exactly between A and P? Four of the following five are alike in a certain way based on their positions in the arrangement and hence form a group. Which of the following does not belong to that group? Which of the following statements is true as per the given information? Who amongst the following is younger than M? Who amongst the following studies in the 8th standard?